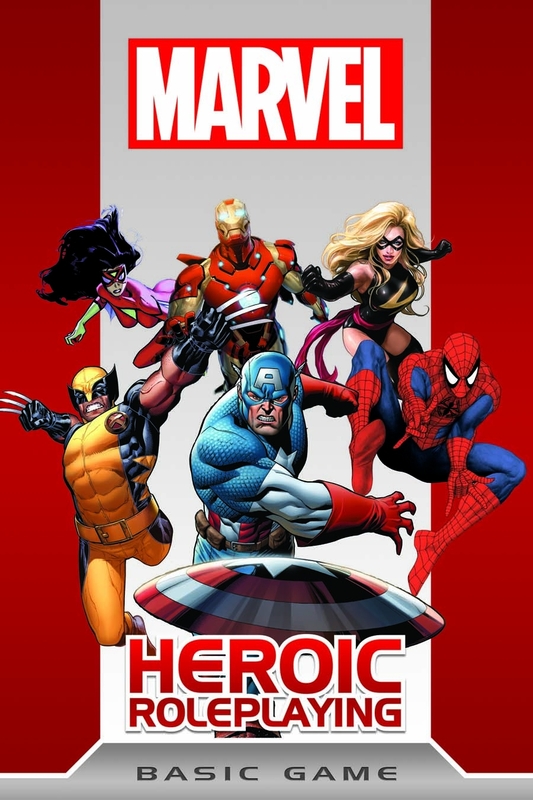 I have now had Marvel Heroic Roleplaying now for about a month. I have read it. Re-read it. Watched games, read reviews and even detailed some characters. Here are my thoughts. First, I have to be honest, I am still and probably always be a DC fan foremost. I "dabbled" in Marvel back in the 80's like others. I enjoyed the X-Men, loved Spider-Man, enjoyed Doctor Strange and Ghost Rider...and that was about it. I didn't have any dislike for Marvel, I just like DC better. I enjoyed the old TSR Marvel game, but I also liked DC Heroes from Mayfair and Villains and Vigilantes. Secondly, MHR is about as far away from the OSR as you can possibly get and still use the same set of dice. Ok. So there are a lot of reviews out for this now, and there is really nothing new I can add to all of that. Here is though less of a review and more of a bunch of my opinions and insights on the game. The most notable feature of this game is there is nothing in the way of comparing ability to ability really. Yes there are things like "combat expert" and there levels of that, but nothing along the lines of Strength vs. Strength So there is no way to tell really who would win in an arm wrestling Thor or Thing. But the deal is that this not something that is likely to happen UNLESS it was part of the plot, then the winner is decided by other things. MHR is more of a game where the players are providing the framework. You need to create your character with the other characters and players in mind. Maybe not as much as Smallville or Leverage, but still. It is also a game where the main drama is about heroes, not really supers. It really is a "comic book" RPG, not a cartoon, supers or even super hero movie RPG. This game is about building characters, the relationships between them and the drama. Which, if you think about it, is kinda what Marvel Comics is about. The game moves well from what I have seen in play and after working with your character you get the hang of the game quickly. The book itself is great to look at, but I was expecting more to be honest. Compare to Green Ronin's DC book. The DCA is overflowing with art. Everywhere. MHR has art, but it seems to use it more sparingly. Plus I swear it was the same characters over and over. I could easily name dozens of character I didn't see, but that is not the point, I would have liked some others. I would have liked to Dr. Strange or some other magical/mystical types since that is my favorite part of any game and Marvel in particular. Strange at least is important enough that he should be included in the Basic rules. Will I play this game? That is really the only question right? Yes, I love to try it out with the right group. To me the right group would be people who are willing to invest in their characters and be able to "play the drama". So yes, with the right group of people. Still I might want to dual stat characters with MHR and some other traditional supers game, maybe even DCA/M&M3. I'll be posting some characters here soon. I agree that with "the right group", of similarly minded Watcher and Players (those wanting to very closely role-play comic book style scenes), it is an incredibly good game. I love it. Tim, I'm going to be running some MHRP at Games Plus this Sunday (4/1) at 1pm, if you're interested. I've never played that game, but it sounds awesome. I'm a Marvel man myself.